French naive painter. He had a passion for painting from childhood but could not devote himself to it regularly until he retired from his job in the Post Office in 1922. In 1925 he was ‘discovered’ by Wilhelm Uhde and thereafter he won wide recognition. His work included genre scenes, flower pieces, hunting scenes and views of Paris, notable for their charmingly wobbly perspective effects. VIVIN, Louis. 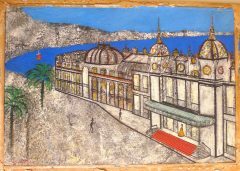 Monte-Carlo Casino.. Oil on board. Signed.